Joanne Rowling was born on this day in Yate, England in 1965. She is 47 years old. Her creative writing career began as a little girl when she would tell her sister Di fantasy stories. At five or six she wrote down a story about a rabbit who got the measles and was visited by a giant bumble bee. The idea for Harry Potter, a boy who finds out he has magical powers and attends a school for Wizards, came to her while she was travelling from Manchester to London. Upon graduating from Exeter University Rowling moved to Porto, Portugal to teach English as a foreign language. There she met Jorge Arantes and fell in love. The two married and had a daughter, Jessica, in 1993. When the marriage ended Rowling moved to Edinburgh, to be near her sister. She struggled financially and she and Jessica lived in a small flat and lived on welfare for a while. While she worked on her postgraduate degree in education (so she could teach in Scotland) She began to write Harry Potter in earnest. Rowling often wrote in coffee shops because taking the baby for a walk was the best way to get her to fall asleep. She completed Harry Potter and the Philosopher’s Stone and found an agent. The book was submitted to twelve publishers before finding a home at Bloomsbury Publishing House in London. The publisher thought the target audience for the book would be pre-teen boys so they asked her to use her initials. She added “K” as her middle initial in honor of her grandmother. They did an first run of 1,000 copies. 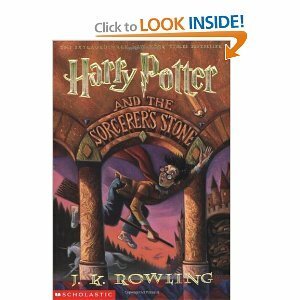 An auction was held for the rights to publish the book in the US (under the name “Harry Potter and the Sorcerer’s Stone.”) Scholastic Inc. won the auction and paid a whopping $105,000. The story of the young wizard took off like a golden snitch. 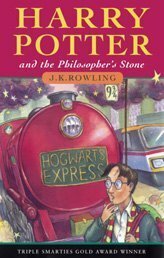 In 1999 the first three books in the Harry Potter series, ...The Sorcerer’s Stone, …The Chamber of Secrets and …The Prisoner of Azkaban held the top three spots on the New York times best-seller list. The books “earned approximately $480 million in three years, with over 35 million copies in print in 35 languages.” according to biography.com. The following year Harry Potter and the Goblet of Fire, the fourth book in the series became the fastest-selling book of all time. It had a first printing of 5.3 million copies. And in 2000 the British Book Awards pegged Rowling as Author of the Year. …The Order of the Phoenix came out in 2003 (an excruciating three years wait for Potter fans). …The Half-Blood Prince “sold 6.9 million copies in the United State in its first 24 hours, the biggest opening in publishing history.” This time the British Book Awards gave the book the prize granting it Book of the Year for 2006. The final book in the series …The Deathly Hallows had the largest pre-order numbers ever. It sold 11 million copies on the first day it was released in the UK and the US. Films of the books (with different directors and screenwriters) started in 2001. They were all blockbuster events. And [despite some serious directing/screen writing and even acting quality issues (IMHO) with several of the movies] they all grossed top dollar and were box-office successes. Royalties from the HP series, movies, merchandise and add-ons have made Rowling Britain’s 13 wealthiest woman. Although the Harry Potter series has concluded (at least for now, rumor has it that she may revisit Hogwarts) Rowling continues to write. Her dark comedy about small town politics, The Casual Vacancy, is due out soon. She works with several charities including Amnesty International, Comic Relief, Gingerbread (formerly One Parent Families), Multiple Sclerosis Society of Great Britain and Lumos. And she established the Volant Charitable Trust to combat poverty. She married Dr. Neil Murray in 2001 and they have two children together. It is also Harry Potter’s birthday. This entry was posted on Tuesday, July 31st, 2012 at 8:18 pm	and tagged with Harry Potter, JK Rowling and posted in Fiction, postaday, Thought of the Day, Today's Birthday, Writing. You can follow any responses to this entry through the RSS 2.0 feed. Thanks for stopping by ritaLOVEStoWRITE. Always glad to meet another Potter fan.